Brooklyn Label, the French corner restaurant in Greenpoint’s historic Astral Building that closed last year, is going to be revived. Now under new management, it will return from the dead with a little help from Le Gamin, another beloved French bistro located in Greenpoint. Opening Thursday, July 27 at Point Green, 7 pm to 11 pm. On view through August 5. 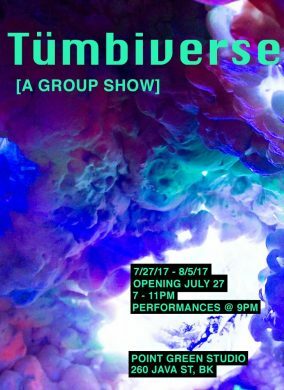 Despite what you may think, “Tümbiverse” isn’t a weird German futuristic version of Tumblr. It refers to painter Michael Bianchino’s sweeping and immersive “technicolor portraits” that invite all types of self-expression. He won’t be the only one creating art, as Bianchino and co-curator Jasmine Williams have asked 20 innovative folk to do what they do alongside his vibrant mini-worlds. The result is expansive, featuring textiles, video art, sculpture, performance art, voguing, and even a living doll experience courtesy of Toshi Salvino. We warned you that Flying Lotus’s debut feature, Kuso, would be one of the grossest, weirdest movies in recent memory. Sure enough, after last night’s Rooftop Films screening an audience member had just one question for FlyLo. In April we shared the sad news that The Water Table’s boat, the Revolution, was hit by a large tugboat, forcing them to postpone their scheduled dinner cruises. Since then, there have been even more setbacks. 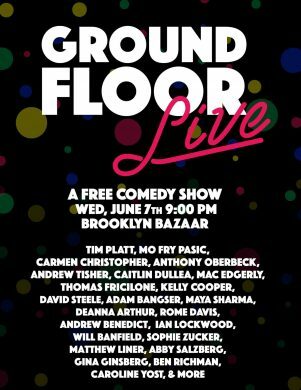 Ground Floor Comedy, an online space for comedic videos and newsletter listing IRL comedy shows in Brooklyn and beyond, will be putting on their first live show tonight at Greenpoint’s Brooklyn Bazaar. There’ll be sketch, improv, and other absurdities from a silly group of comics and performers, many of which will be familiar faces if you’ve ever been to the Annoyance or new weekly series RUDE at South 4th Bar. The whole affair is guest hosted by Mo Fry Pasic and Tim Platt, who always bring a special something to shows. 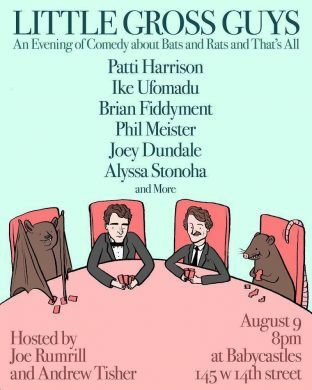 If you come early at 8pm, there will be a “meat themed variety show” to spotlight new voices in the comedy scene, and I love a good themed show. The night’s performers include Richard Kennedy, Tendayi Kuumba, and Larissa Velez-Jackson of the group Yackez. In addition to dancers and DJ sets, there will also be a special MC workshop led by producers from “nightclub hybrid” Jackie 60. It’s always amusing to hear new transplants to New York speak excitedly of summer in the city. Those of us who have lived here longer know with grim certainty that the city will soon transform into a giant sauna filled with rotting garbage. Not quite a dystopian hell. But close. However, there are some things to look forward to in the summer. One of them is Films on the Green. Cinema buffs – and francophiles – will want to mark their calendars for the popular outdoor film series, which returns June 2nd and runs through the 7th.